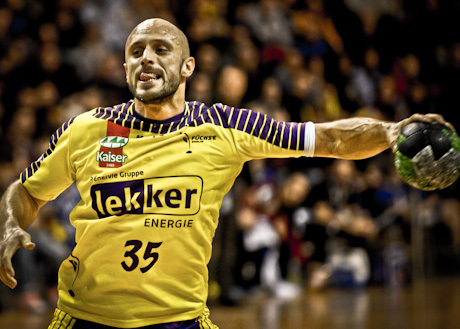 To play in the Bundesliga is a big challenge for every sportsmen in handball. The Bundesliga is something like the NBA of our sport. Every game is tough and you have to play on the highest level all over the year. Of course Berlin is a very interesting city with lot of possibilities. The club Füchse Berlin is a very interesting project which established as a top team in Bundesliga since the last years. "Here I understood that handball is a big sport which is calling a lot of attention", Konstantin says. "My flag, my country, my team", this it what Tino says when you ask him about national team. He is always ready to play for his country and want to develop the handball in Russia with successes of the national team. "It is a privilege to play for your country and it makes me proud to be part of the team", Konstantin Igropulo says. Actually it is a hard period in Russian handball, but this is what it makes interesting to play there, as Russian national team is not something like a "gold team". 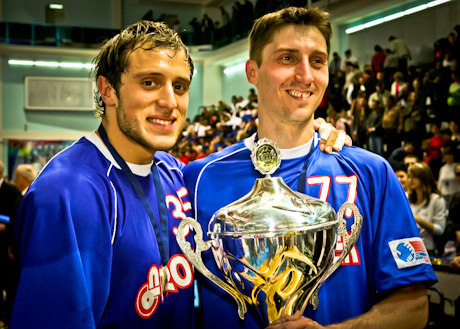 We have a big goal together to put Russian handball back to the top of international handball. Barcelona was the first big experience outside Russia for Konstantin. Everybody knows what FC Barcelona means in the world of sports and it also means this for Tino. "It was a gold experience for me to play in this club", Konstantin says. He really understood in Barcelona what the word of "team" really means and what it means to play next to stars like David Barrufet. "It was the time of choice in which way the handball career will go and to show to my colleagues in Russia how it can go when you are open to new experiences", Tino says. The station in Chekhov was a big part of Tinos career. He started to play in Chekhov the same time as in the national team. This was the time when the people was recognizing Konstantin Igropulo in the international handball business. It was like a accelerator of men handball in Russia. In Tinos first year in Chekhov the club won the cup of the cups, which is still today the biggest success in club history.